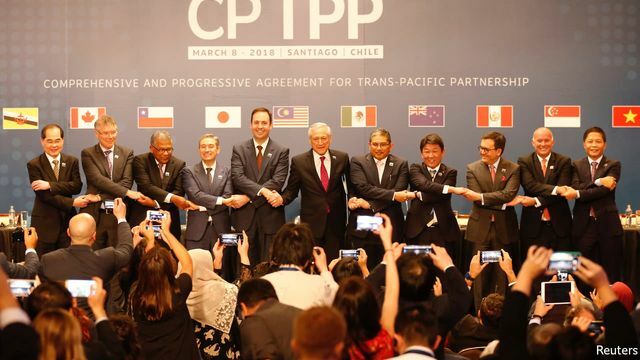 Last month Chile hosted the signing of the Comprehensive and Progressive Agreement for Trans-Pacific Partnership (CPTPP), the successor agreement to the stillborn Trans-Pacific Trade Partnership (TPP). The TPP was championed by the US under the Obama government, but the Trump administration withdrew from the accord in January 2017 after it was finalised in October 2016. Chile mediated negotiations for a new agreement, which included all the parties to the TPP except the US, adding a projected 0.3% of GDP to members’ economies in the coming years, encompassing 13% of global commerce. Negotiations for an updated agreement were facilitated by the omission of the TPP’s List of Suspended Provisions. These had been insisted upon by the US but questioned by consumer rights advocates. The list had extended copyright periods for intellectual property including pharmaceutical formulations, which would have delayed the entry of generic drugs in the pact’s lower income emerging markets. Nevertheless, proponents argue that the CPTPP still clarifies intellectual property rights compared to existing national legislation in the target markets. Other clauses include guarantees for digital information, access to government bidding processes for foreign investors, and the suspension of tariffs on 95% of goods. The US business community remains generally supportive of the plan. Notwithstanding its positive reception towards the 2018 US tax bill, it has criticised recent plans to increase tariffs on steel imports, with 47 of 50 American trade associations citing negative effects for their members in a recent Economist survey. Commercial groups will likely lobby that the US join the CPTPP after elections in 2024.